The seventh entry in The Five-Year-Old’s ongoing Photo Documentary series about the Dedham Public Art Project. 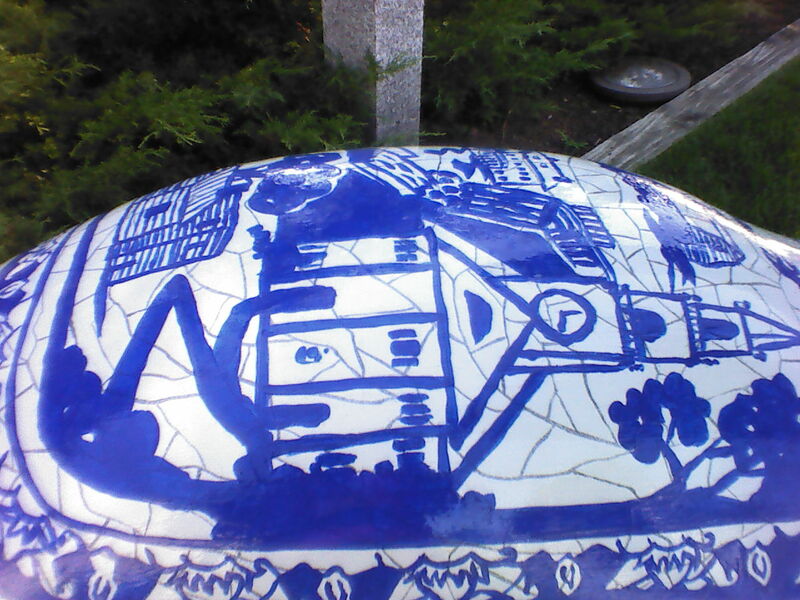 This week on Through the Lens, The Five-Year-Old visits Ear Ye, Ear Ye – A Tail of Dedham Pottery by Elaine Matt Schaffner. 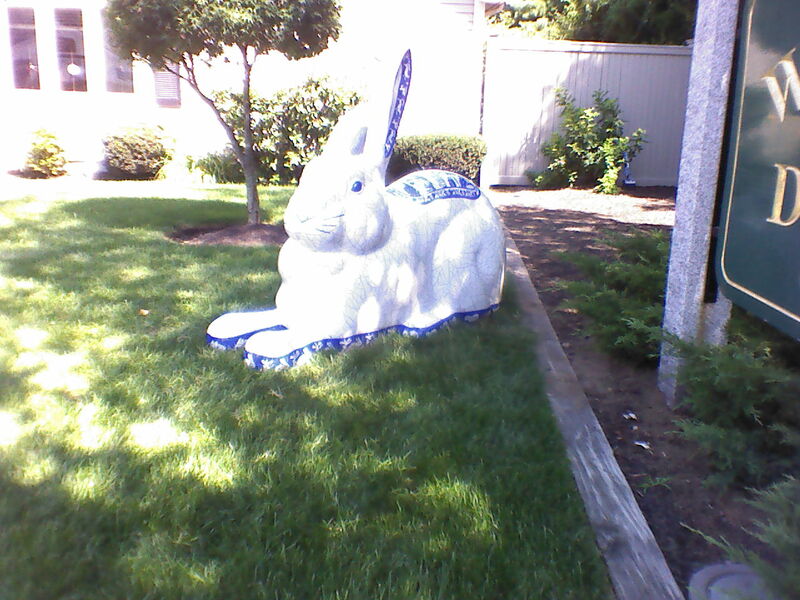 Local readers can find the bunny on East Street by the Boston Lightning Rod Company and Willard Home Improvement. When she’s not busily applying imitation crackled glaze to gigantic fiberglass bunnies, Elaine Matt Schaffner paints commissioned oil and watercolor portraits of families, pets, and houses, or abstract works of art designed to complement specific interior design projects. She has also been commissioned to create murals and painted furniture for designer showcase homes and private residences. Like The Five-Year-Old, Schaffner remains more interested in the spontaneous act of creating art than in the final product. In 2011, Schaffner challenged herself to tackle the interplay of color and light in a new way by painting from real life only. Taking up the sport of plein air painting (the act of painting outdoors) was a wonderful excuse for Schaffner to return to the rural landscapes she loves. Today, Schaffner takes a set of paints with her nearly everywhere she goes. She paints with watercolors on location, and uses those watercolor studies (and the photographs she takes on her travels) as inspiration for the oil paintings she creates in her Milton, Massachusetts studio. Dedham Pottery logo. Look familiar to anyone? 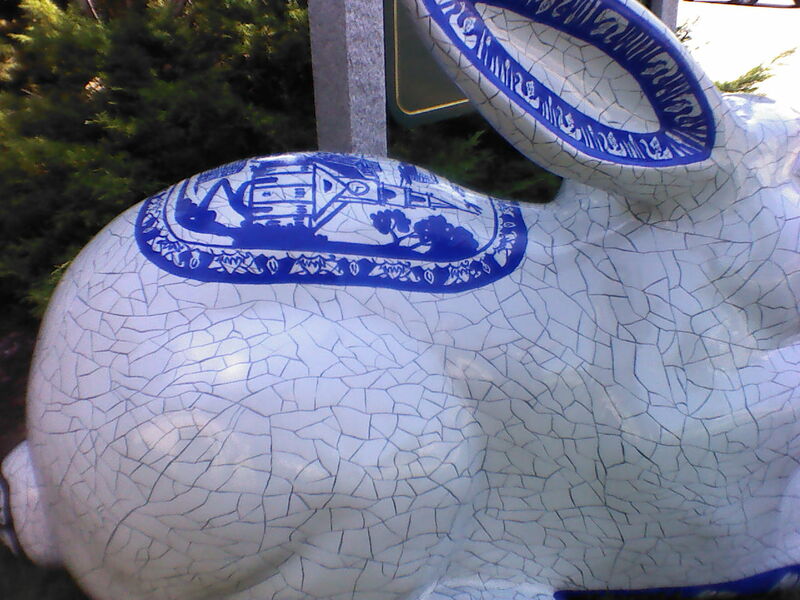 To fully appreciate Schaffner’s bunny with its imitation crackled glaze and the gaily painted blue and white plants and animals that ring the bunny’s ears, feet and back, it helps to know a little bit about Dedham Pottery. Founded by the Robertson Family in 1896 at the height of America’s Arts and Craft Movement, Dedham Pottery quickly became known around the country for its high-fire stoneware with thick cobalt border designs and controlled fine crackled glaze. Hugh C. Robertson modeled the crackled glaze on his own pottery after the blood-red crackled glaze he saw on several pieces of Chinese pottery on display at the 1876 Centennial Exposition in Philadelphia. 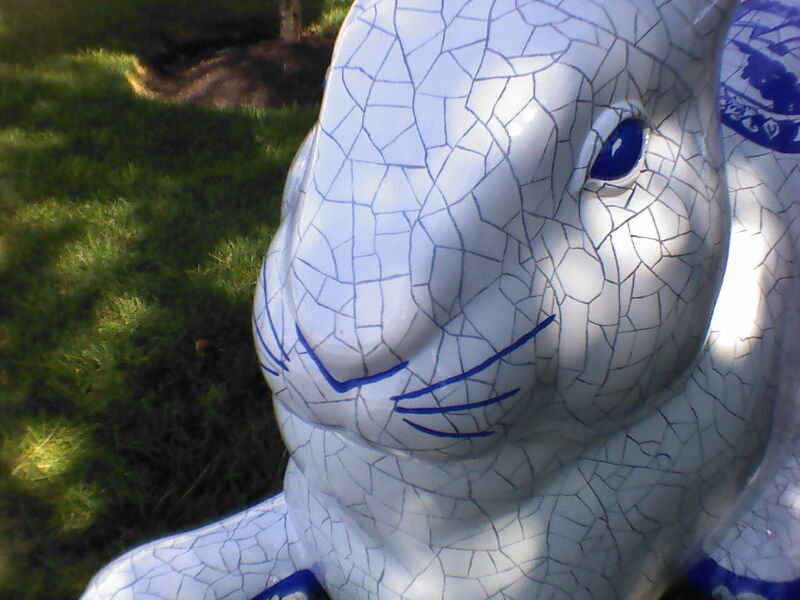 The company’s most popular pattern was the iconic crouching bunny which inspired the gigantic fiberglass rabbits that are rapidly taking over Dedham. Oh, right. 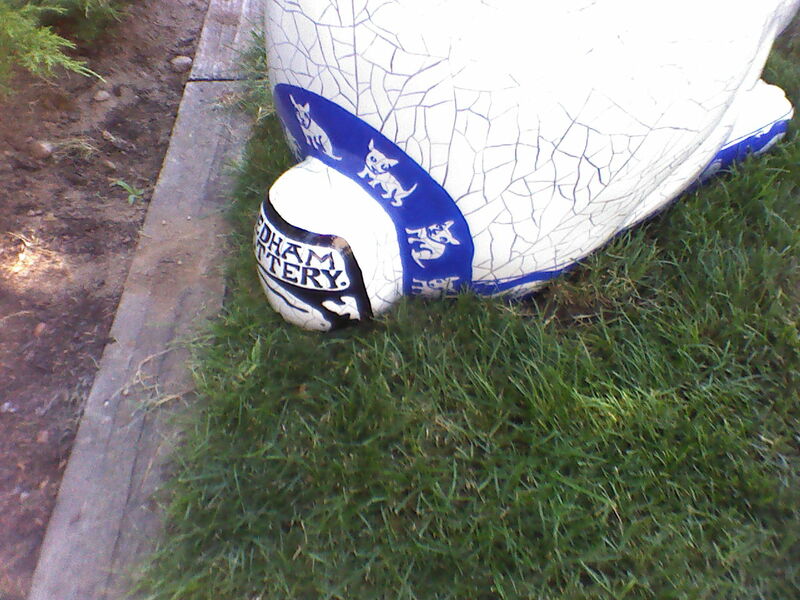 You can read more about Dedham Pottery here anyway. Want to see more of Schaffner’s work? Visit her website at www.elaineschaffner.com. 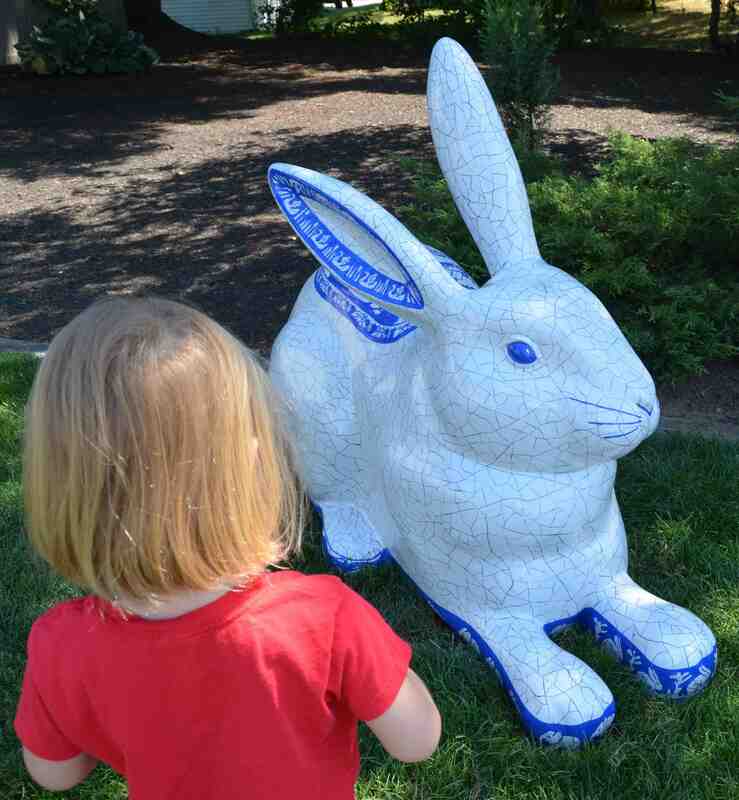 Be sure to tune in tomorrow, when The Five-Year-Old interviews Jill Barry and Mike Glowacki, the artists behind the Peace Bunny at Oakdale Square Common. Breaking News from Your Caterpickles Official Junior Photojournalist: Bengal Bunny Vandalized!